what a challenge in the 100 degree heat here in NM! I used the basic Pink, black, white and added green for my colors. For this card I tried something different. 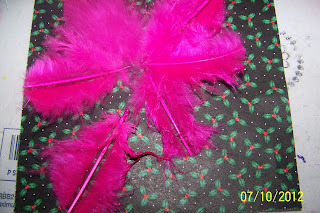 A flower made out of feathers - Pink feathers. First I rounded the feathers to look more like a flower. Then placed onto the card front with a Zots dot adhesive Jumbo forming a circle. Next I added a Zots 3-D and added another round of cut feathers (3). Last added the white pearl button. Tip: cut feathers in a large bag to keep the mess under some control. and decorative layer in 1 1/2". Hope this gives you an idea of something different to do. Feathers! What a great idea! 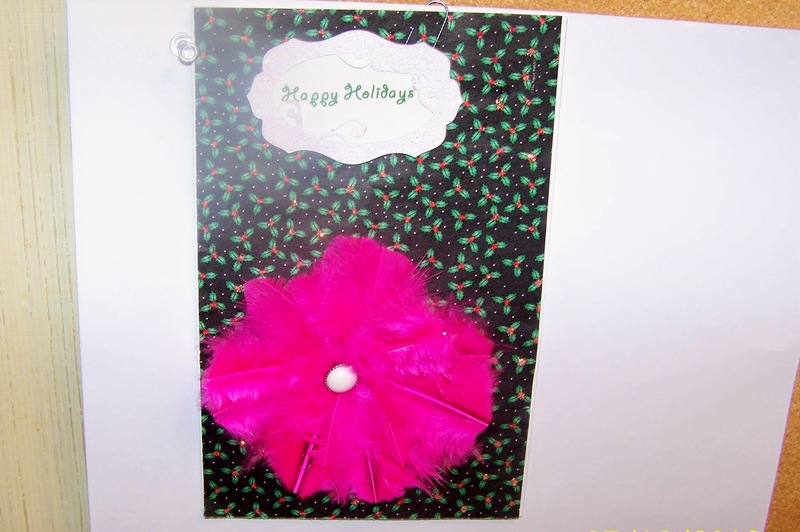 I have never thougt to use feathers on a card. You go girl! I will have to try that idea. This is such a cute card and i love the use of the feathers! Nice touch with the pink feathers, Sherry. I like your twist on a festive Christmas.